RealNetworks is one of the most storied names in video streaming-if you’re on the wrong side of 40. If you’re younger, than odds are you never heard of the company. On Wednesday, August 16, RealNetworks announced an agreement to deploy Advanced RealMedia HD (RMHD) Technology in China. What do we know about the codec? There’s a white paper on the RealNetworks website that provides a few other technical details. To test RMHD quality, the Shanghai-based researchers encoded RMHD and H.264 clips (but not H.265) at 480p, 720p, and 1080p, with the RMHD data rates 70% of H.264. Adhering to ITU-500 testing procedures, the test subjects viewed the comparison clips and then chose a winner. This produced the graph shown below, where the blue bar represents the percentage of responses that considered RMHD quality the highest at each of the three tested resolutions. Figure 1. Quality comparisons with H.264. 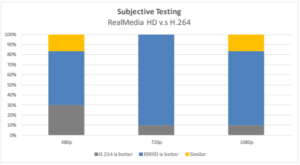 The researchers concluded, “RealMedia HD saves presently up to 30% of bitrate on average compared to H.264 while achieves the same subjective image quality”. Not to be persnickety, but this doesn’t prove RealNetwork’s marketing claims of increased “compression efficiency of 30% – 45% vs. H.264,” which is curious. Though the researchers didn’t include H.265 quality in their comparison, the white paper goes on to compare RMHD, H.264, and H.265 in encoding time, CPU consumption (Figure 2), and battery life and found H.265 lagging in most tests. Figure 2. CPU utilization comparisons; H.265 is yellow, H.264 grey, and RMHD blue. However, note that RealNetworks tested playback CPU and battery life on four devices with CPUs ranging back to 2012, with none newer than 2015. So it’s unlikely that any featured HEVC playback acceleration (while I tried to confirm this, I couldn’t, so I could be wrong). Of course, HEVC playback acceleration, which is a standard feature of most mobile CPUs, GPUs, and/or SoCs today, would change the battery life/CPU utilization comparison completely. What about VP9? Not mentioned in the white paper. What can we surmise? As mentioned, Netflix found VP9 quality similar to HEVC, so VP9 should outperform RMHD. What about playback CPU? For my recent book, Video Encoding by the Numbers, I compared CPU playback requirements for H.264, VP9, and HEVC on a tablet without HEVC acceleration, with a graph from the book shown in Figure 3. At or about the same CPU requirements as H.264, VP9 looks similar to RMHD. Figure 3. CPU utilization for H.264, VM9, and HEVC. This tells me that VP9 likely offers superior quality with similar CPU playback and battery life scores as RMHD. So it’s unclear how or why RMHD is superior to VP9. The white paper details multiple encoding options for Windows and Linux. For playback, the white paper mentions Android and iOS SDKs, but no Mac or Apple playback. Windows playback appears to be via RealPlayer HD, which probably won’t fly given the general move towards HTML5 playback and the reticence by most viewers to download a player to watch video. Where’s that leave us? Well, we have another codec in our midst. Unlike V-Nova’s PERSEUS, which seems to be targeting ultra-low bandwidth and H.264 replacement in set top boxes, RMHD doesn’t have an apparent niche, or any apparent technical advantage over VP9. As mentioned at the top, CIBN Oriental Network, an OTT provider in China, has announced that they will implement RNHD on their platform by the fourth quarter of 2017. It will be interesting to see which platforms CIBN targets, and how it works out for them. You can read a brighter outlook on this transaction at http://www.scmp.com/tech/enterprises/article/2107524/realnetworks-hits-mother-lode-chinas-booming-market-video-streaming. The article noted that RealNetworks actually created the codec in their research facility in China, and boosted claims of efficiency to 50%. Here’s a quote from Chairman Rob Glazer. Clearly the last thing we need is another proprietary codec and that too from someone who does not have the market clout. If they really intended to go the proprietary way, it would have been better for them to use HEVC or VP9 as their benchmark. I am really not sure what good RMHD is going to do to Real.